Exceptionally effective for pain and swelling from bumps and bruises on skin or joints. For external use only. 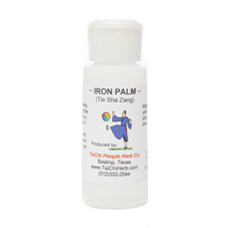 Similar to Iron Palm, however, with the Super ingredients, this liniment is exceptionally effective at reducing the pain and swelling due to bumps and bruises on skin or joints; also reduces pain and swelling when applied to insect stings, acne or infection (skin heat). Application: For external use only. Rub a few drops on affected area and allow to dry. Repeat 2-3 times daily. Note, when applied to cut or scraped skin, this liniment stings for a short time. Ingredients: aconitum radix, areisaema rhizome, cridium fructus, pinellia rhizome, stemona radix, speranskia herba, draconis os / dens, lycium cortex, viola yedoensis herba, lithospermum radix, pharagmites rhizome, sulphur, artemisia herba, ferox resin, muschos, notoginseng, rubbing alcohol. Size: 2 fluid ounces. Produced by TaiChi People Herb Co, LLC in USA.